GRAPELAND – As a rule, very seldom – if ever – does a community welcome a drug dealer to town. For many rules, there are exceptions and for Heather Harrison, the City of Grapeland will definitely make an allowance. You see, she’s no ordinary pill pusher. She’s a registered pharmacist and an integral part of the Brookshire Brothers Express team. Along with pharmacy tech Jamie Bauer, Dr. Harrison hopes to provide Grapeland area denizens with easy access to pharmaceutical care. The Queen City of the Sand Flats had been without a pharmacy since Dan Walling retired and closed Walling’s Pharmacy in the fall of 2014. 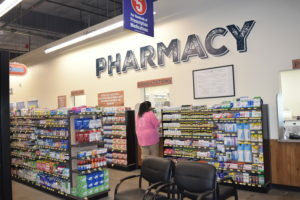 While Walling’s retirement was not to blame, the closure of the family owned and operated drugstore resulted in local residents having to travel to Crockett, Elkhart or Palestine to fill their prescriptions. F or some, this travel created a bit of a hardship. With the opening of the new apothecary on Wednesday, Oct. 26, Dr. Harrison and her staff of trained professionals hope to alleviate the aforementioned difficulties and to help make coping with medical maladies easier for the northern Houston County populace. 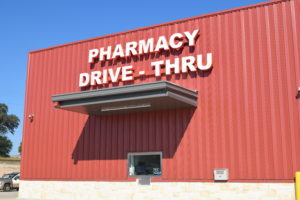 The facility also has a drive thru for added convenience. Prior to the Brookshire Brothers Express Grand Opening celebration earlier this week, Dr. Harrison sat down with The Messenger to discuss the new pharmacy, its role in the community and her role in the pharmacy’s operation. Dr. Harrison indicated she received her undergraduate degree from Texas A&M University. After finishing her coursework in College Station, she said she began working for Brookshire Brothers as an intern. “I was working in Brookshire and also in Hempstead. 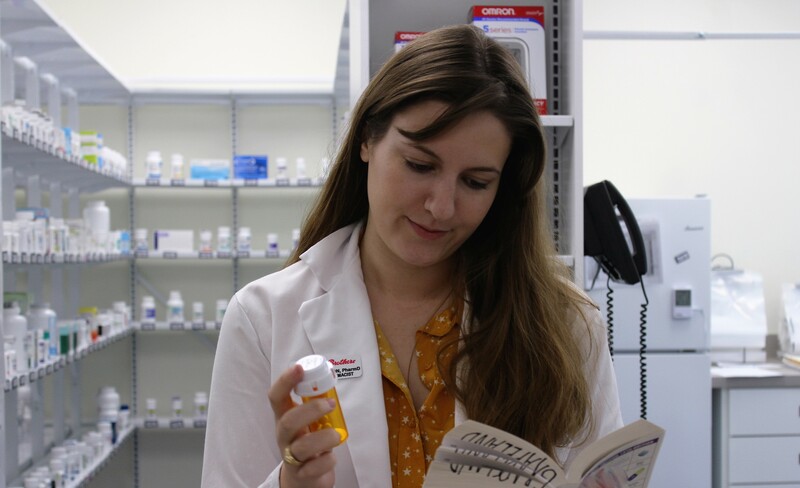 When I graduated from the University of Houston’s College of Pharmacy, I took a job with Brookshire Brothers as a pharmacist,” she said. Harrison stressed the pharmacist of today is a vital part of the full healthcare spectrum. “Our role is a lot more complicated than most people think. It’s a lot more than just putting pills in a bottle. Whenever we look at someone’s prescription, we look at their entire list of medications to make sure there are no drug interactions and make sure everything is being put to good use by the patient. We also take care of immunizations and flu shots. When we are looking at a patient, we look at the whole picture. We want to make sure there are no allergies to the prescribed medications and we want to make sure we are treating all of their disease states,” Harrison indicated. T he transfer process was also discussed by Harrison. “The pharmacist – in this case it would be me – has to make the call to the other pharmacist and pharmacy. We write down the prescription, the medication strength, the number of refills a patient has remaining and any other directions the medication might have. We will enter that into our computers here and after that, the patient will then be able to fill their prescription here in Grapeland, just like they would at their other pharmacy,” she explained. Given the abundance of military veterans in the Grapeland area, Harrison was questioned about cooperative efforts between the Veterans Administration (VA) and the Brookshire Brothers Pharmacy Division. “We do accept Tri-Care Insurance. We don’t work directly with the VA but we do accept that insurance,” she said. After the opening day festivities, Dr. Harrison reported the Brookshire Brothers Express Pharmacy had filled over 40 prescriptions on Wednesday and by mid-morning on Thursday, Oct. 27, the pharmacy “… already filled between 20 and 30 prescriptions. We also have another stack of 10 or 15 (prescriptions to fill), right now. We’re up and going,” she said. The hours of operation for the pharmacy are from 8:30 a.m. until 6:30 p.m., Monday through Friday. On Saturday, the pharmacy is open from 9:00 a.m. until 1:00 p.m. and it is closed on Sunday. From all of us at The Messenger, we would like to welcome Dr. Harrison and the entire Brookshire Brothers Express team to Grapeland. Previous articleDon’t Go Into the Light!